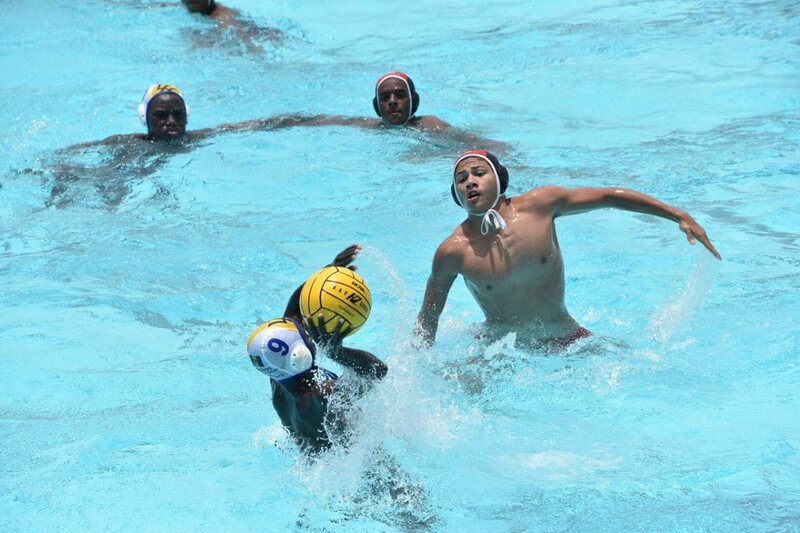 TT's Ross Gillette gets close on defence against his Barbados opponent in the Carifta Water Polo Championships in Wildey, Barbados. TT continued to dominate the 2019 Carifta Water Polo Championships when matches continued at the Aquatic Centre in Wildey, Barbados, yesterday. All the TT teams are in contention for gold today after the 14-and-under coed, 16-and-under boys, 19-and-under girls and 19-and-under boys all displayed brilliant performances, yesterday. Nathan Hinds and Josh Fuller were the stars for the 14-and-under coed against Curacao as both players scored five goals each as TT stormed to a 22-2 victory. Bonaire was also no match for TT in the 14-and-under coed as the latter prevailed with a 23-0 win. The onslaught continued with the TT 16-and-under boys crushing Curacao 17-1 with Christian Chin Lee and Benjamin Chiw Quan both getting hat-tricks. Tahirah Beepat was the top player for the 19-and-under girls as she found the net five times to propel TT to a 15-4 win over Barbados. The 19-and-under boys maintained their perfect record in the tournament with a 18-8 victory over Bonaire. The 16-and-under boys only lost to Bahamas 11-7 on Friday and the other TT teams are unbeaten. TT will be aiming for gold in all the age groups from 3.10 pm, today. Reply to "TT in the hunt for water polo gold"